It all started with the design*sponge post on Fern Living's new designs. 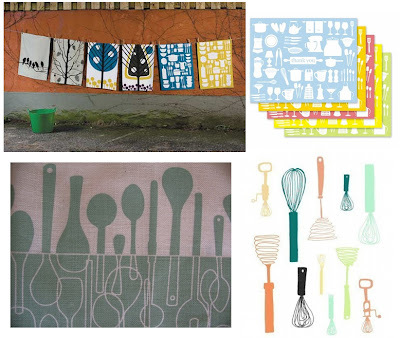 Once I saw the tea towels I immediately thought of these KT Originals thank you notes that we have that also feature kitchen gadgets (is it just me and my stationery-warped mind that sees the similarity?). The towels and the stationery started me thinking about the well-loved and oft blogged about Borrowed Spoons tea towel by Skinny laMinx. Etsy, of course, led me to the I Love Your Eggbeater print from dazeychic.